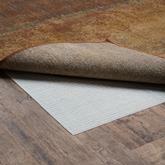 Just about every area rug needs a rug pad or underlayment to go under them. This is done to protect the floor that it is being placed on but also it can keep the rug from slipping and to add additional cushioning to the rug, thus making it feel softer when you step on them. 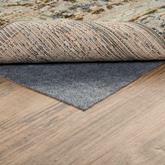 If you are planning to purchase an area rug, it is always a good idea to pick up an area rug pad to go along with it. Using an underlayment is a very important part of owning an area rug, and for anything larger than a very small throw rug, you should always budget a little bit extra in your shopping fund to purchase one of these items. Without a pad, your rug is much more prone to being damaged—and to causing damage, too. What is an Area Rug Pad Used For? 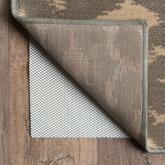 At its most basic, an area rug pad is used to keep your rug from sliding around all over the floor. While you may have a carpeted floor and feel that you do not need a pad for this purpose, it is still important to remember that rugs slide around on carpeted floors as well. If you want it to stay in place without getting bunched under furniture or scooted across the room every time someone steps on it, be sure to use an area rug pad. This is an efficient way to protect them from increased damage from daily use. This works both ways, however, in that your floors will also be protected from damage caused by area rug placement. They are backed with different types of materials that are built to be durable and keep them from wearing out over time. However, if you have real hardwood floors, your floors may become stained, discolored, or otherwise damaged from this backing. With and underlayment, you do not have to worry about this potential outcome. Of course, these pads have other purposes as well. You can use them as an underlayment for your area rug to keep people from tripping on your beautiful piece of home décor, too. Since they will not be prone to creeping or getting flipped up at the edges, it reduces the risk of anyone falling on an even rug. What is an Area Rug Pad Made Of? Rug pads are made from many different types of materials, some of which are better choices than others. To provide the best possible padding for your rug and to keep your floors from becoming damaged by the rug pad itself, it is a good idea to familiarize yourself with the possible materials you might encounter while shopping for one of these items. Some of the most affordable pads you might come across are made of PVC or vinyl. These are two very similar materials that are synthetic in nature. Since they are made from chemicals, certain types of floor treatments, particularly on real hardwood floor, may react poorly with these pads and cause similar damage to what you might see from the area rug itself. If you have a carpet, tile, masonry, or other type of flooring, you should have no trouble with vinyl or PVC pads. Latex and rubber are your best choice if you are looking to preserve the life of a real hardwood floor underneath your area rug. These types of materials are not often as highly chemically treated as others may be, so the chances of causing discoloration to your floors are much lower. However, be careful not to choose a rug pad that is made from a latex synthetic blend, as you may encounter the same issues you would see with a fully synthetic option. Choose a wool or felt and rubber blend if you want to pick one that is not made of any chemical or synthetic materials. Knowing a little bit about the materials can go a long way toward helping you keep your flooring and your rug both safe and looking great for years to come. 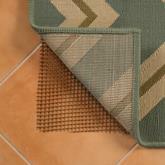 It is easy to select the right area rug pad for your home. Keep in mind that there are a few different aspects you should consider when choosing it. When you understand these categories, you will be able to make the right choice right away. Thickness – Choose the right thickness for the location of your rug and the material it is made out of. Thin throw rugs do not require much padding at all, so be sure to stick to the smallest thickness you can find. This way, you will not take away from the casual feeling of it by making it seem as though it is much larger or thicker than it should be. Size – Of course, considering the size of your rug is the best way to choose your pad. Choose one that is either the exact size of the rug itself or very slightly smaller on each side. Do not choose one that is too large, or you will be able to see it from the side when you look at your rug. 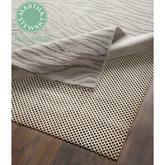 Placement – The placement of your area rug sometimes dictates what type of underlayment you need. 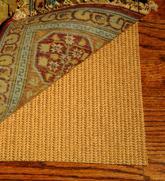 For example, a rug in your entryway or hallway does not need much in the way of padding underneath it. Although these are usually walked on frequently, they are not often thick enough to begin with, and they are not meant for standing on for long periods of time. 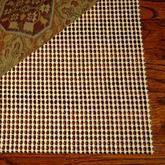 Kitchen rugs, however, should have thick, durable padding to make them comfortable enough to stand on for a long while. 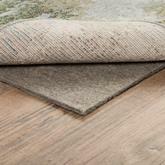 Choosing the right rug pad for your area rug does not have to be difficult. 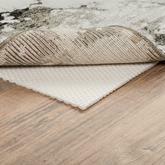 When you understand the three main aspects of shopping for one and you know what types of materials you will be looking at, you can easily pinpoint the right rug underlayment for the job. Remember to pay close attention to the type of flooring you have, as well as the size of your area rug and the placement of it in the home. In no time, you will have the right pad to help keep your rug comfortable for a long time to come.